Microsoft's Bing is stepping up its assault on Google with bevy of new features available Wednesday that include the addition of Wolfram Alpha search results, enhanced previews of Web sites within results, improved presentation of weather forecasts, and limited Facebook integration. Bing's new additions are the latest in a series of updates that have included Visual Search, Facebook and Twitter integration, improvements to Bing Maps and the rebranding of MSN Video to Bing Video. Here is an overview of what's new on Bing starting Wednesday. Bing has partnered with Wolfram Alpha, the computational knowledge engine, to help you make better choices for your health and your waistline. When you search for a specific food item on Bing, your results will return nutritional content information about that food including fat content, calories per serving, vitamin and mineral content, and other important facts. Do a search for "banana" and you'll discover the fruit has 3 fat calories, 14 grams of sugar, and 10 milligrams of Vitamin C, and its average serving size is 118 grams. You can also find out the nutritional content for your favorite brand name foods like the Big Mac, Whopper, and various candy bars. 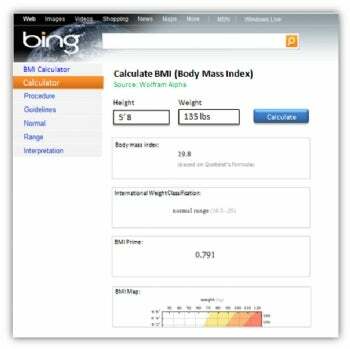 After figuring out where you went wrong in your diet, you can use Bing's Wolfram Alpha integration to determine your body mass index. BMI is a widely used, and somewhat controversial, measurement that estimates your ideal weight range based on your height. To figure out your BMI on Bing, just enter "BMI" into the search bar followed by your height and weight, like this: BMI 5'10", 175lbs. When Bing debuted earlier this year, it included a feature called Quick Preview that lets you see a text-based synopsis of the pages displayed in your search results. The concept was nothing new, but Bing believed it was an effective way to reduce what it calls "bad clicks" -- selecting a search result only to find the site didn't have what you were you looking for. Last month, we heard about new social search features coming to Bing and Google. 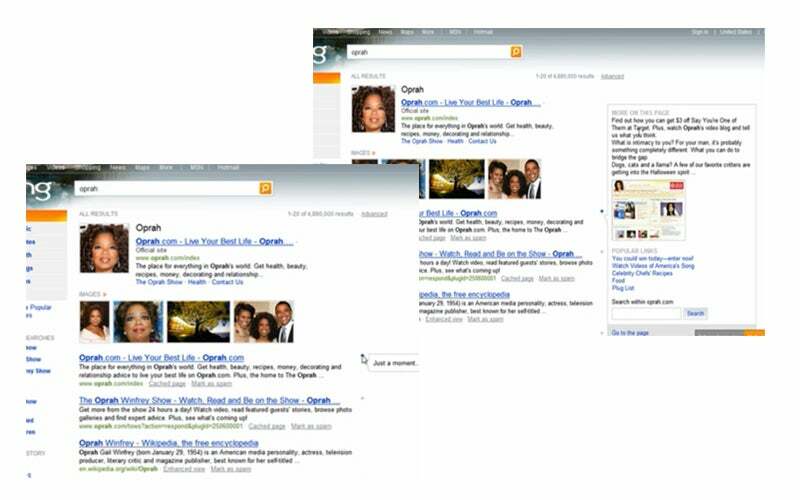 On Wednesday, Microsoft revealed another part of Bing's social twist with Facebook previews. Enter a person's name, and if their Facebook profile is publicly available, you will see their profile picture and Facebook network, and you can send them a message or friend request right from Bing's results page. To try out the new hover preview, click on the blue plus sign to the left of your Bing search results. 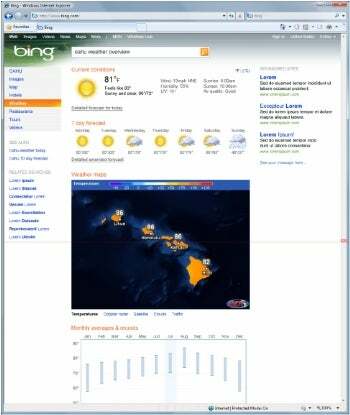 Bing can already direct you to detailed weather reports, but you have to click through to MSN Weather to see them. Starting today, Microsoft has removed that extra step by delivering full-page weather information on Bing's search results page. Enter a city name into the Bing search bar, and then click on the weather link within the main search results. This will deliver a full-page weather report including current conditions, seven-day, extended and detailed weather forecasts, Doppler radar, and satellite images, as well as monthly averages and historic records for precipitation. When Microsoft scrapped Live.com in favor of Bing earlier this year, many pundits believed Microsoft would be hard pressed to ever become a dominant player in online search. But Redmond has remained undaunted, and is looking to make up for lost time by unleashing a slew of new features to help Bing compete with its main rival, Google. To that end, Microsoft says it has more surprises in store for Bing users later this week. Keep your eye on Bing's community blog for more information, and be sure to check in with PC World where we'll break down and discuss all of Bing's latest additions.